These Facebook Messenger templates serve specific types of businesses and their marketing needs. 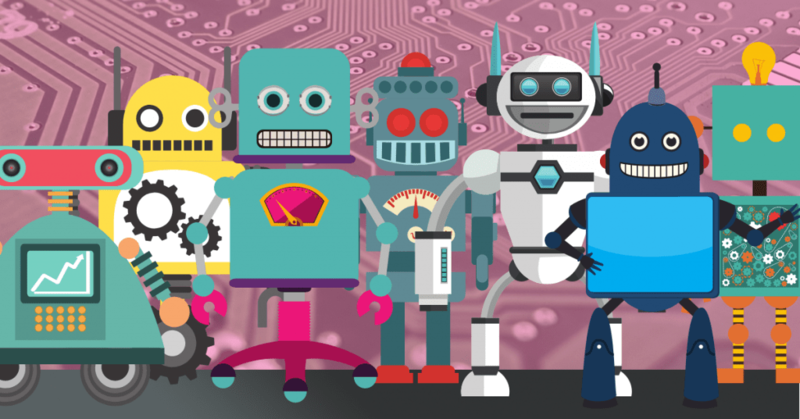 Here you’ll find out what’s inside 14 bot templates designed for various businesses to help you start using chatbots to grow your business within minutes. Review MobileMonkey’s chatbot examples for more inspiration on tools you can use to drive leads and new contacts in Facebook Messenger. How Do I Activate a Bot Template in MobileMonkey? It’s easy to set up or test any of these Facebook bot templates. When you want to peer inside the dialogues and funnels that make them tick, you’ll find the templates ready for your selection. Pick “Start from a template” to choose one of 14 Facebook bot templates designed for every industry and common use cases! Add them to your Facebook Messenger marketing mix for free with MobileMonkey. 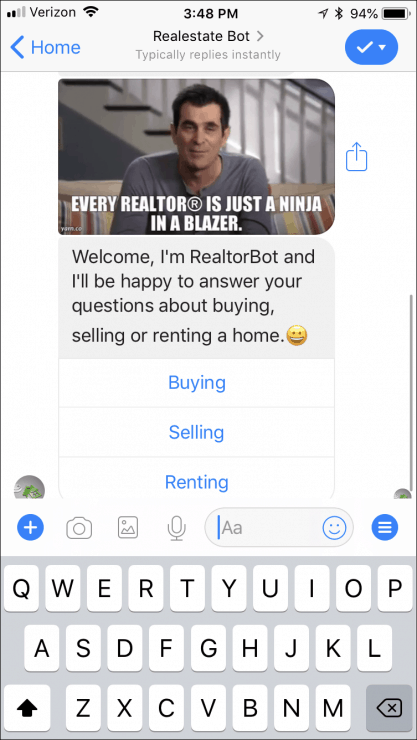 Explore the real estate chatbot in Messenger here. Real estate professionals handle tons of inquiries from prospective buyers and sellers every day. Chatbots can take care of a lot of the initial work that goes into the process of a home sale. 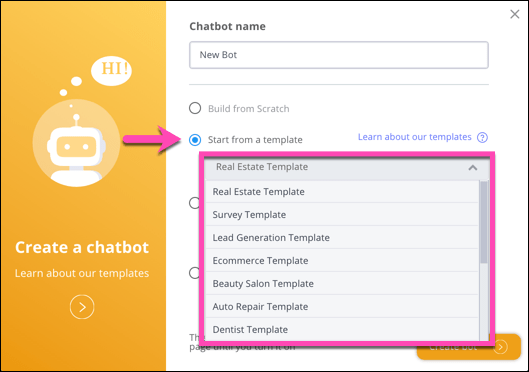 That’s why our real estate chatbot template includes pages for buying, selling, and renting properties. When a user first interacts with this bot, they can choose which of these options best matches what they’re looking for. 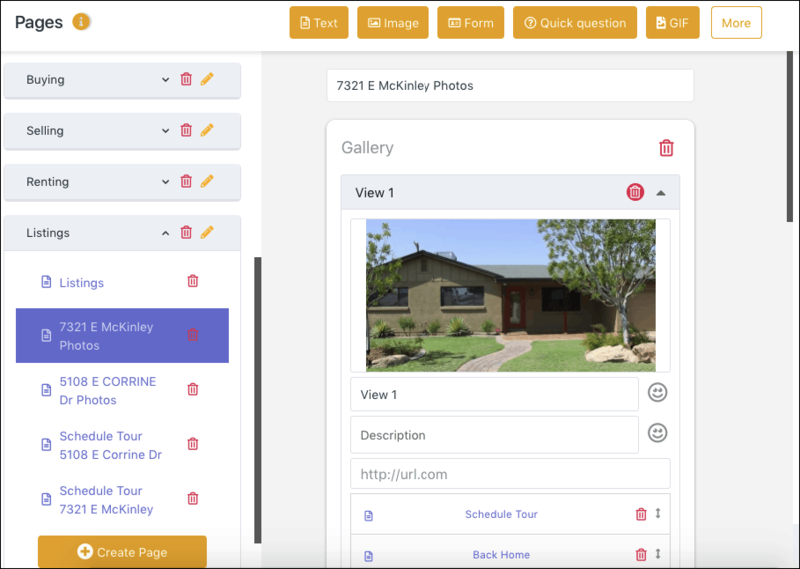 Then, if they’re interested in buying, selling or renting, you can use the bot to showcase individual listings in a way that’s more engaging than scrolling through a website. You’ll have their contact info to follow up, and if something catches their attention, they can get in touch with an agent to learn more. 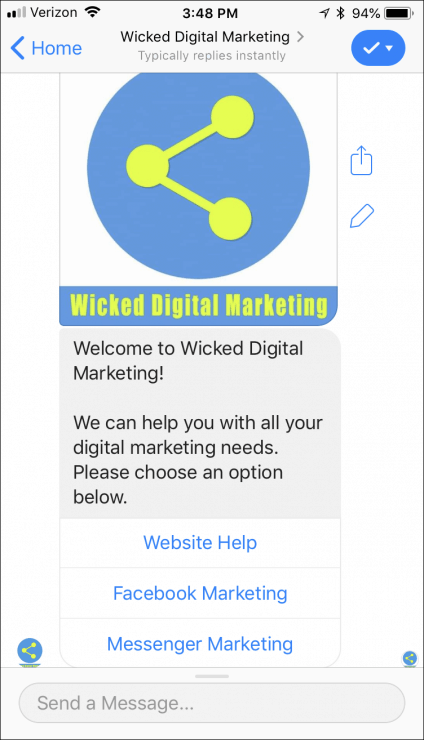 See the lead gen chatbot template in Messenger here. Collecting contact information from a prospective client enters them into your sales funnel and gives you the chance to move them through the buying process faster. That’s what our lead generation chatbot template is designed to do. In the lead-gen chatbot template, our fictitious business is hosting an event to get new leads. You can customize the bot to offer a download or webinar, for instance. This bot can collect leads on autopilot even while you’re heads-down with existing client work. In fact, the bot is set up so that it emails you a notification when new leads sign up so you can reach out and get in touch with them when you’re available to talk. 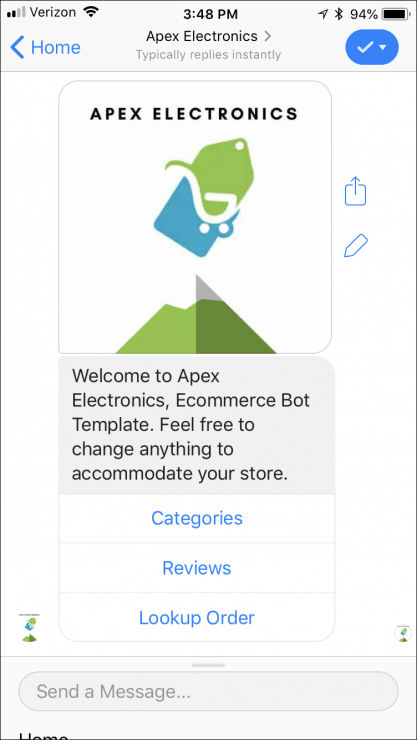 Size up the ecommerce chatbot template in Messenger here. The ecommerce bot template is designed to help you showcase specific products and guide customers to the ones that are right for them. First, you can create product galleries, complete with photos of each item, a brief description, and a link to its product page on your website. This way, users can easily learn about what you have to offer. If they find something they like, they can quickly navigate to your site and purchase it. Bots made from this template can also assist customers when they contact your business about existing orders. The bot can collect order information and pass that info along to your customer support team so that when an agent is available to step in and help, they already have all of the information they need. 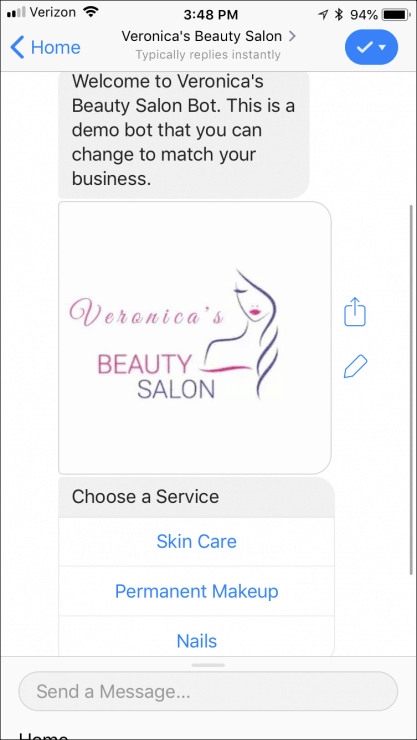 View the beauty salon chatbot template in Messenger here. Setting appointments and attracting new clients, that’s the lifeblood of any spa or salon. Here’s how to get more appointments and automate appointment setting and some amount of customer service and FAQs for clients of a salon or beauty service provider. 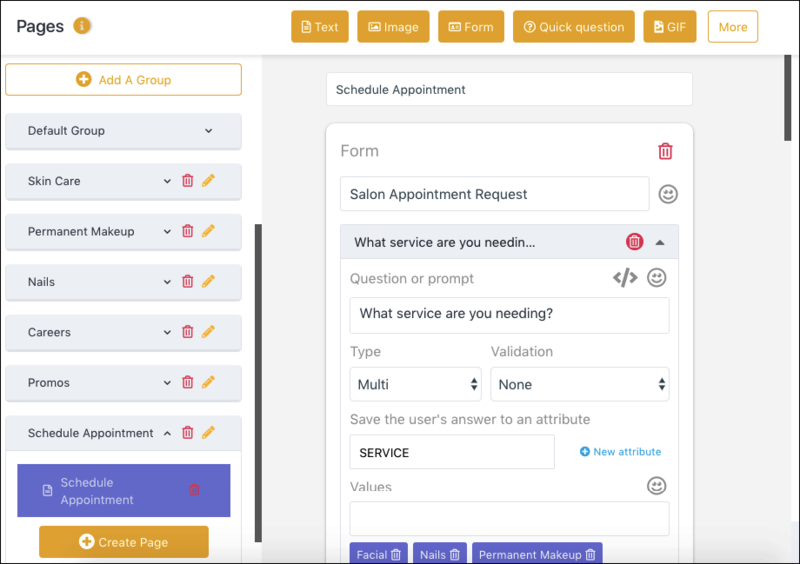 The beauty salon bot template contains customizable pages to help users learn about all of the different services you offer and any promotions you’re running. This way, clients can choose the exact service they want and find pricing information they need. The template includes a scheduling page that lets clients request appointments for specific dates, times, and services. Whenever a customer requests an appointment through your bot, you get a notification via email. Then you can add the appointment to your schedule and reply with a confirmation. Or, you can automate the process by connecting your calendar and appointment setting service directly to the chatbot. 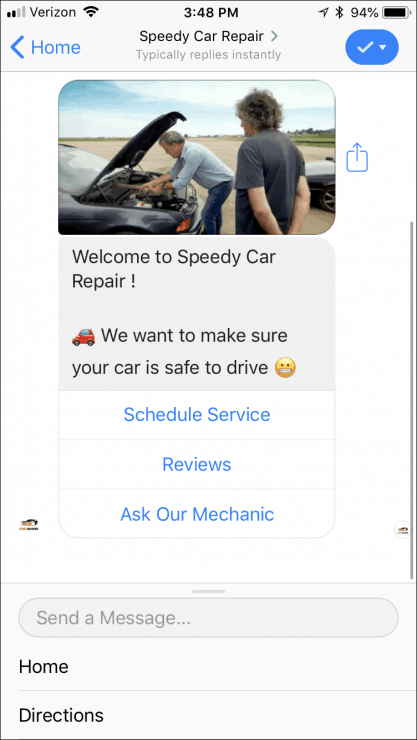 Rev up the auto repair shop chatbot template in Messenger here. The auto repair shop bot helps customers schedule appointments at the shop. You can customize it further with specific qualifying questions such as the make and model of someone’s car. This way, when you receive their appointment request, you’ll be able to get an early idea of the work involved and cost estimate if necessary. The template also allows customers to submit questions, which you can later answer when you’re available. And the bot helps you with marketing for the shop by inviting customers to leave reviews about their experience. Add those reviews to your bot so new potential customers to your bot can see the feedback of happy customers. 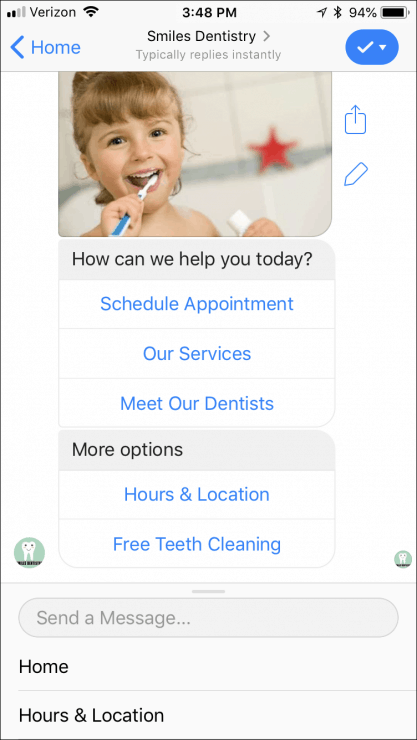 Brush up on the dentist chatbot template in Messenger here. The dental or medical office bot will help with appointment setting and answering common questions an office gets, like hours and address. Doing these common and repetitive tasks with a bot can ease the cost or burden for front-office staff. Customize the dentist chatbot template with basic office information like your hours, location and services. Tell clients or potential clients a bit about each of the dentists at your practice, including their experience and a friendly photo. Did you know that for many people, simply being able to put a face to the name they’re reading can go a long way in helping them feel more comfortable scheduling an appointment? And when a client is ready to book an appointment, your bot can help with that, too! 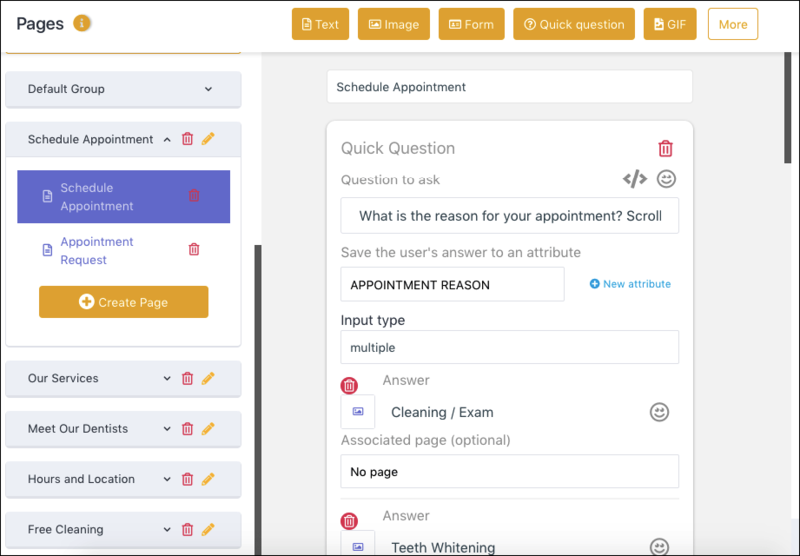 The dental office chatbot template includes pages that enable users to schedule both first-time visits and routine appointments. The template also includes pages to customize with any promotions you’re offering, like a first-time client cleaning or teeth whitening package, to encourage contacts to take advantage before they expire. 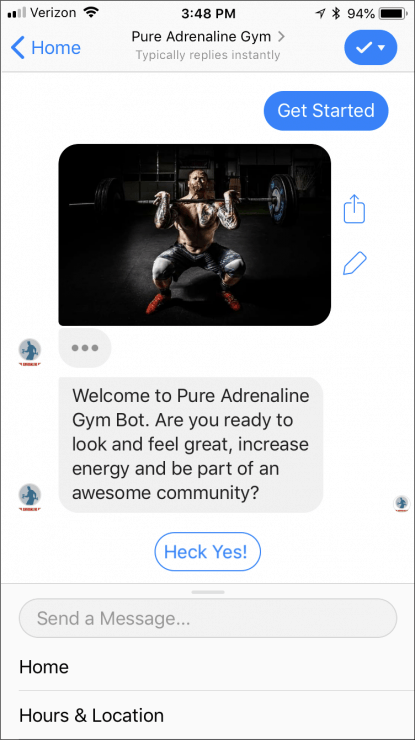 Exercise the gym chatbot template in Messenger here. Stay in touch with your gym members, notify them of new classes, programs or facility upgrades, and encourage new member referrals by implementing the gym Messenger chatbot. Ease the burden of front-office staff by answering frequently asked questions like gym location, hours, and pricing, and the ability to collect new member inquiries so your sales team can follow up. The gym bot template comes with a page that offers a free trial membership or free health evaluation. This way, even if the user is testing the waters, you capture a lead that you can follow up with motivation to check your gym out in person. The template also comes with pages you can customize with information about specific classes, pages to introduce personal trainers, and forms to sign up new members. Hop over to the coach chatbot template in Messenger here. For personal trainers, the personal trainer bot helps establish and maintain personal relationships with individual clients. This same template can be modified for anyone who coaches, trains, educates, motivate or otherwise consults with individuals. Personal trainers can use this template to collect basic information from prospective clients like age and experience level. You can collect lead information and encourage them to schedule a free consultation. 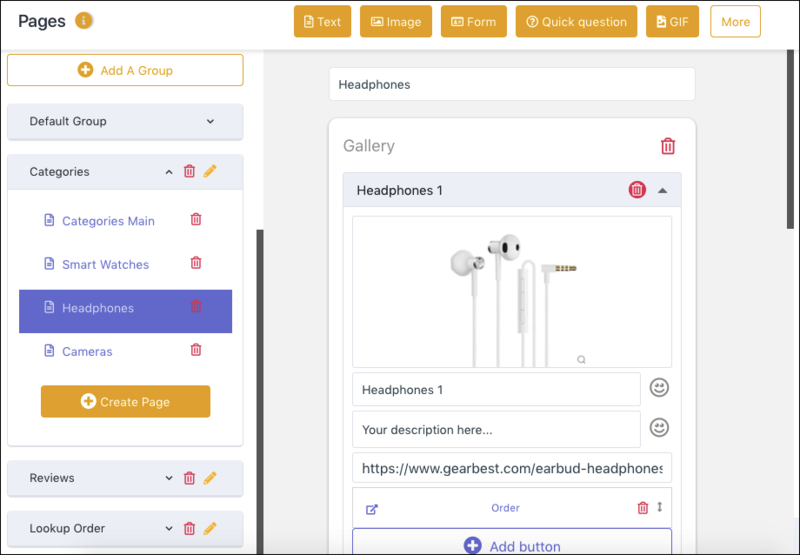 And as you customize the copy within the template, you can use MobileMonkey chatbot personalization techniques to tailor the experience to individual users. This template can be customized so your bot also shares fitness tips with users and encourage them to sign up for your subscription updates list. This way, you can not only share additional content via newsletter but can also reach out personally to learn more about their fitness needs and goals. 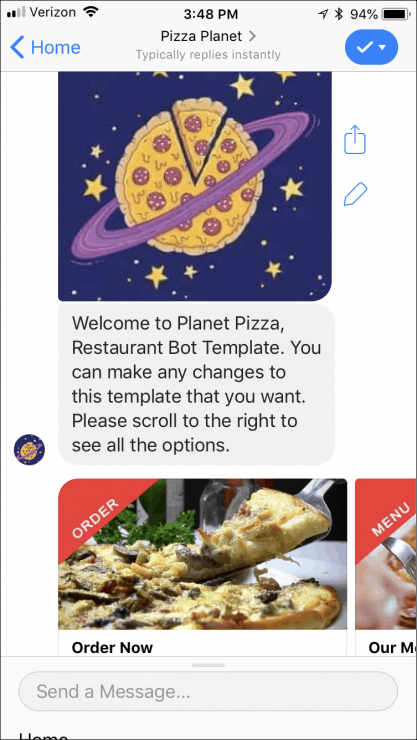 Sample the restaurant chatbot template in Messenger here. Restaurant owners and employees don’t have time during a busy shift. 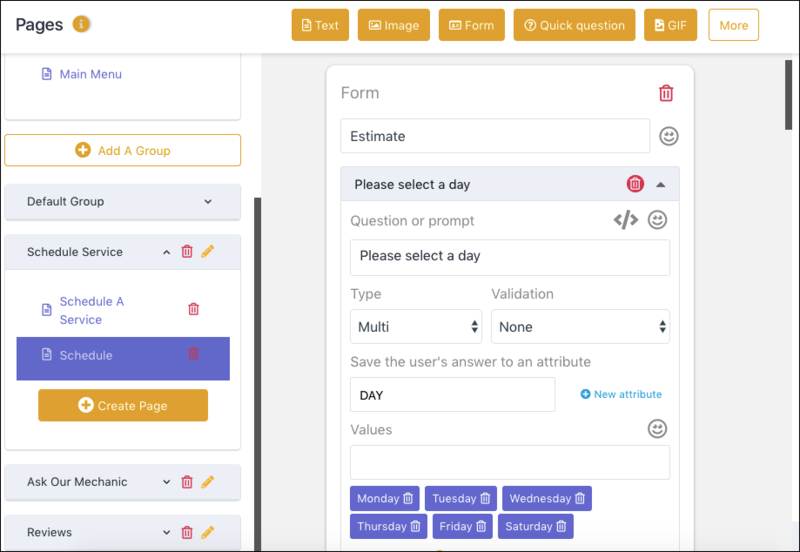 But you can use this bot template to help your customers get the information they need and complete a few important tasks, even when your staff isn’t available to assist them. Add image-rich information about your menu to make it easy for customers to browse and whet their appetite. 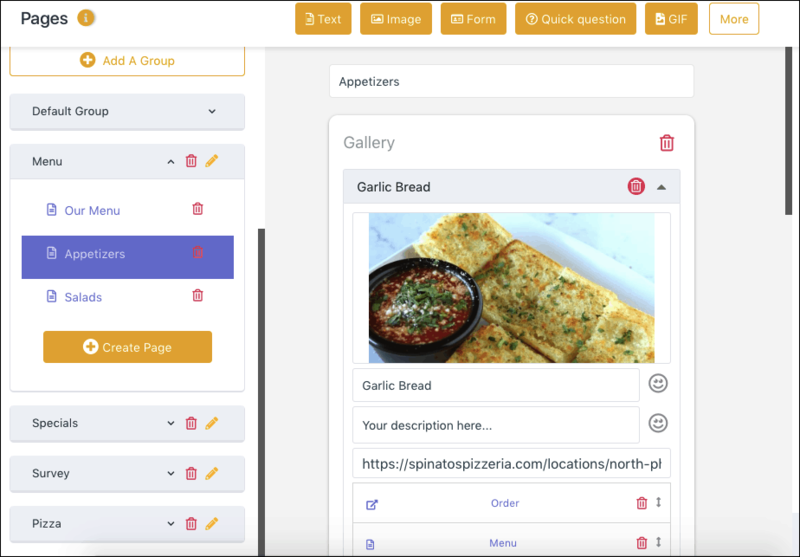 When they see something they like, your bot can direct them to the appropriate places to make reservations and place online orders. This way, customers can take those actions without the assistance of an employee. The template also includes a simple customer survey. Your bot can encourage customers to complete surveys or provide reviews in exchange for coupons and discounts. Try out the podcast marketing chatbot template in Messenger here. Use a Facebook Messenger bot to promote your podcast and grow your listenership, subscribers and get more reviews! 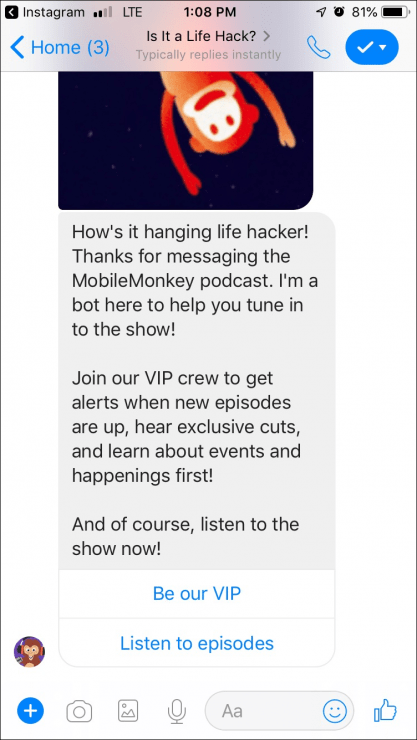 You can customize your podcast promo bot so people can subscribe to updates like when new episodes are available. Let your listeners get details about the show hosts, guests and topics by customizing your bot with answers to FAQs. Use MobileMonkey’s lead magnets like Facebook post private replies and Messenger ads to get new show subscribers. And invite show reviews in your drip campaigns! The template has an opt-in page you can tailor to your own show and voice. Messenger’s best-in-class open rates will help you grow your listeners and increase engagement with your show! 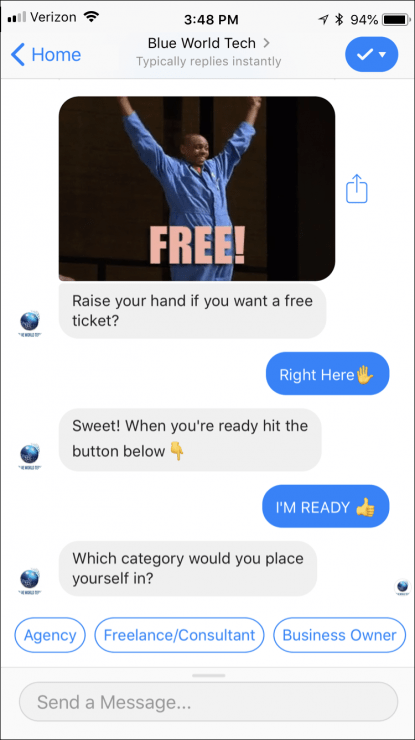 Test out the agency chatbot template in Messenger here. Marketing agencies are often the first to take advantage of new marketing tools and trends. Chatbots for Facebook Messenger are a natural tool to providing prospects and subscribers with industry research and high-touch lead nurturing. This is why we made a chatbot marketing template specifically for marketing agencies. This template is intended for digital marketing professionals offering digital marketing and advertising services, from web design and maintenance to SEO, PPC, content, social, PR and branding. The chatbot can be customized to tell prospective clients about each of the services that you offer, and help prospects determine services best-suited to their needs. 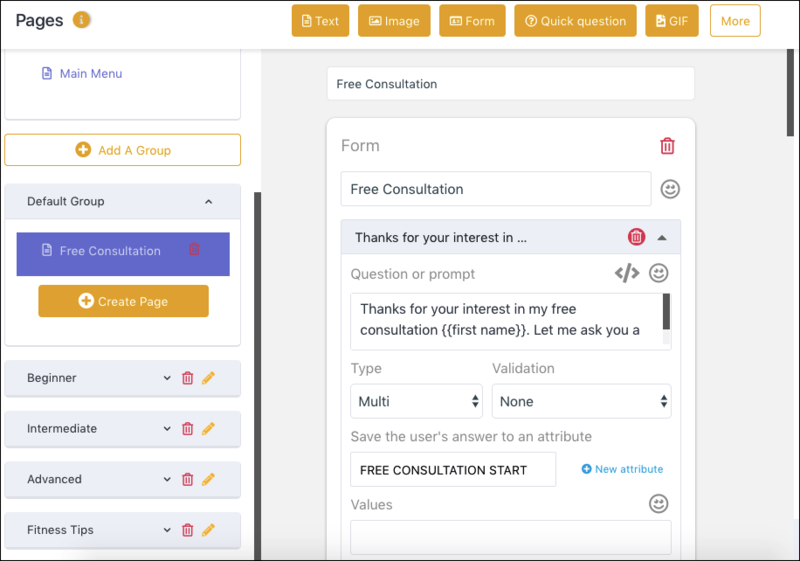 When users are interested in a quote or more info, they can fill out a contact form with additional details about their project. This makes it easy to collect information about prospective leads for your marketing agency. And when your sales team is ready to reach out, they’ll have a lot of helpful information to have an informed conversation. Test out Cat Howell’s agency chatbot template in Messenger here. 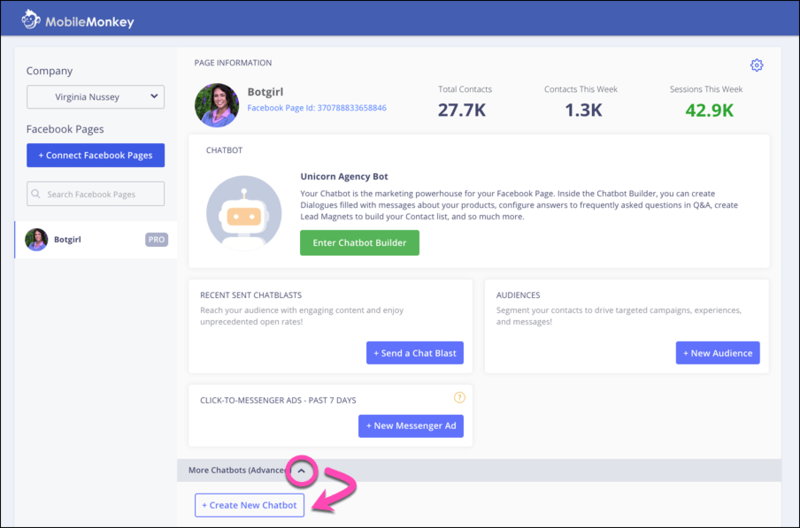 Since Catherine Howell walked through how she uses a Facebook Messenger bot to qualify leads to her Facebook agency, people have been clamoring to get their hands on it. Understandably. Cat’s the creator of the Facebook Ads Academy, as well as the 80,000 member strong Facebook Group, FB Ad Hacks. Her Facebook marketing agency, Eight Loop Social does over six figures revenue each month. And she’s known for her specialty of helping Facebook agencies scale. 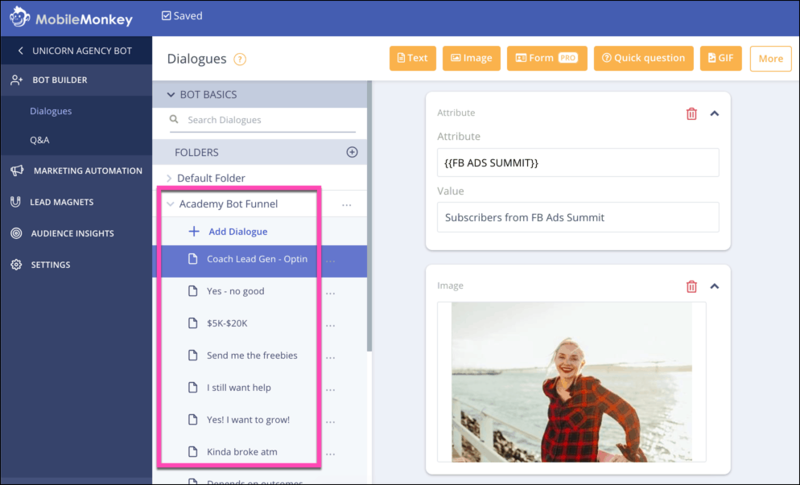 When you peek inside the “Academy Bot Funnel” in “Cat Howell’s Agency Bot” template, you’ll see a sophisticated sales funnel that learns more about the visitor from hello to handshake. 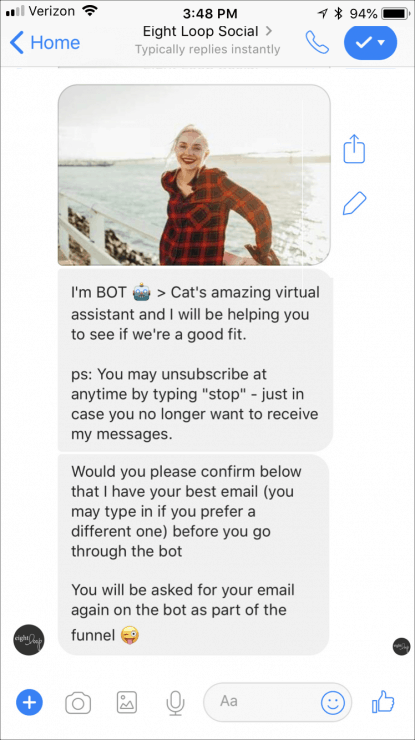 Cat Howell debuted her bot to the public at the MobileMonkey Facebook Ads Virtual Summit and we immediately added it to MobileMonkey bot templates. 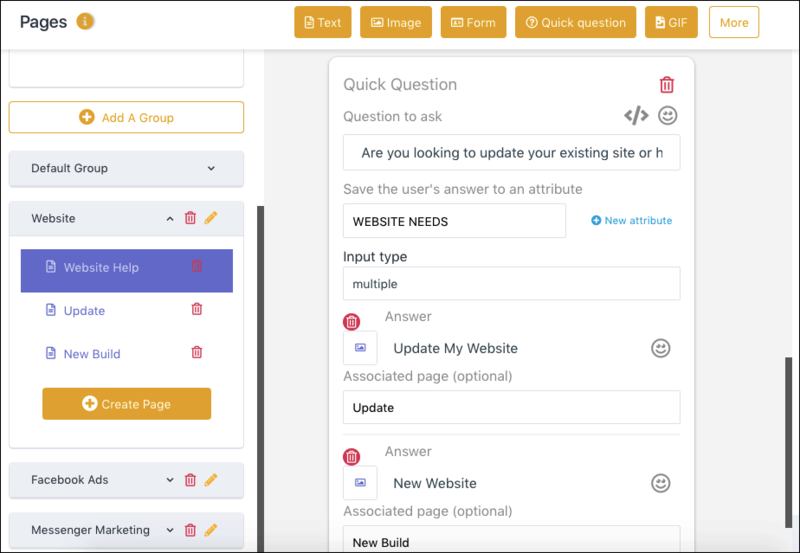 Customize Cat’s bot with your own lead qualification questions and agency details for a quick automated assistant for your digital marketing agency’s lead gen campaigns. 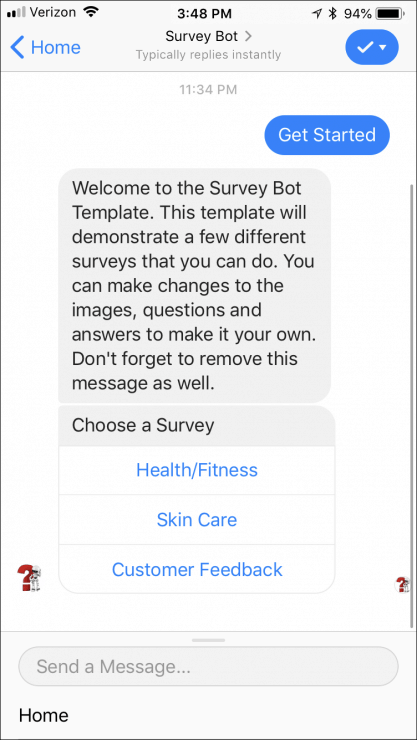 Survey the survey chatbot template in Messenger here. Customer feedback is extremely valuable for every business. Collecting it isn’t always easy. 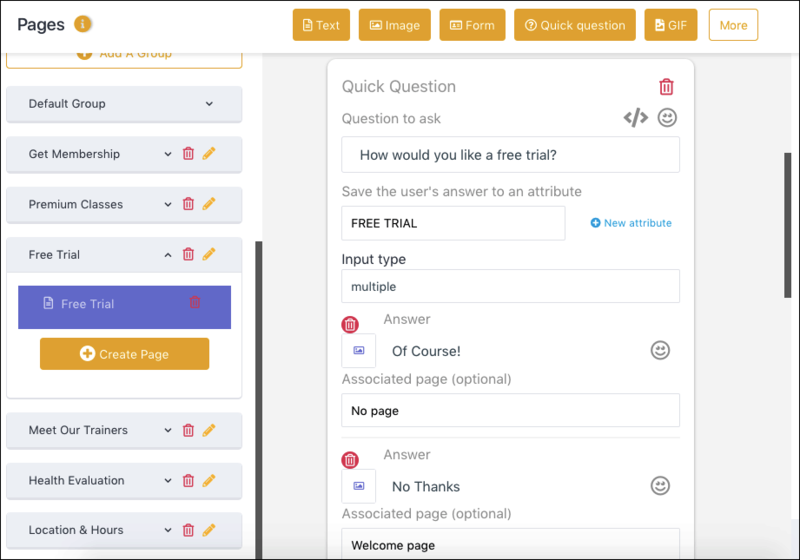 Our survey bot template has everything you need to ask and collect customer feedback in a way that’s so easy and streamlined for customers that it increases the rate of completed surveys. In this template, you’ll find pages for gauging a customer’s experience and knowledge, getting their opinions on specific products, and gathering general customer feedback. Of course, you’ll want to edit the questions to be specific to what you want to learn about your audience. Compared to email surveys, Facebook Messenger chatbot surveys are an alternative that’s not only faster and easier but also more likely to reach the intended audience while being much more engaging. 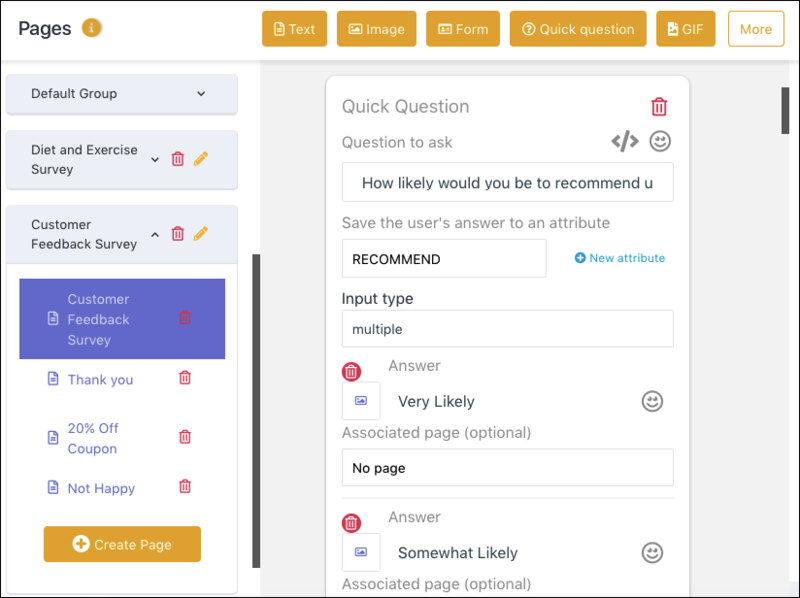 Not to mention, the survey feedback isn’t anonymous and once a user has completed your survey, you can send follow-up messaging, content and offers that are hyper-relevant to your contact’s interests and needs. 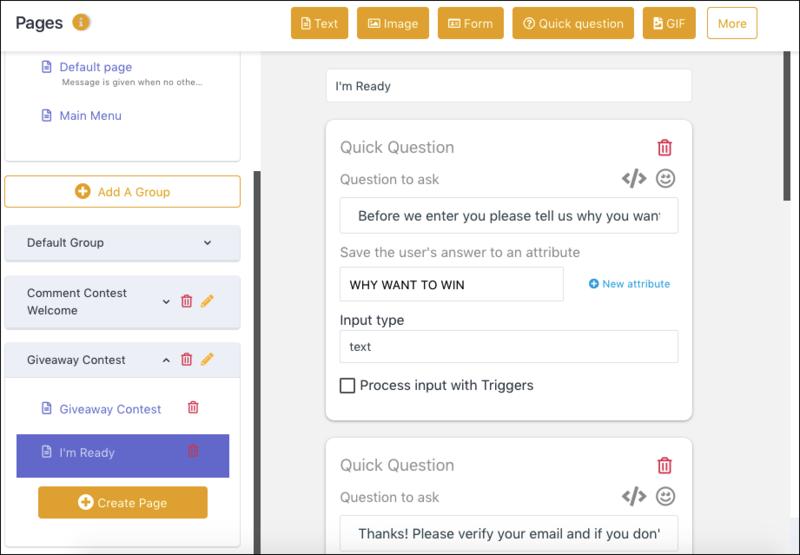 See the contest chatbot template in Messenger here. Contests can skyrocket exposure, earn followers, and drive new leads. But running contests can be complicated and hard to execute. 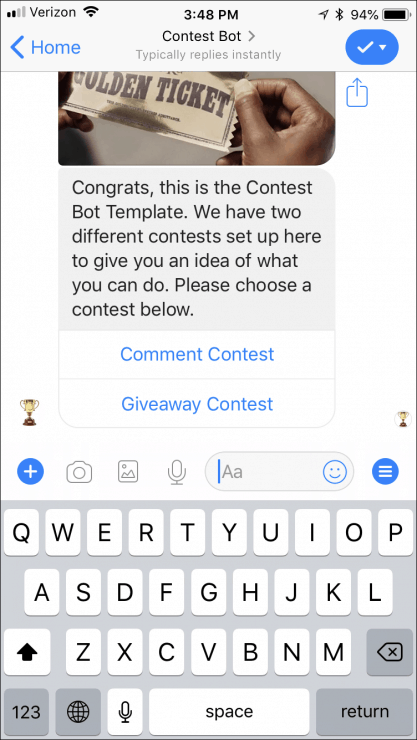 The contest bot template has the framework for a contest run through Facebook Messenger. Within the contest chatbot template, you can choose to run either a comment-based contest or a giveaway contest promoted by other means. How does a comment-based contest work? Create a Facebook post and set up a comment autoresponder in MobileMonkey. When someone leaves a comment on your post, your bot will automatically send the contest entry to that person in Facebook Messenger. If they’ve never messaged your page before, you’ve gained a new Messenger contact. If they’re an existing contact, you’ve gained an engagement that opens up the opportunity to send follow-up promotional messaging. Wins all around! Regardless of the style of contest you choose, your bot can confirm to users that they’ve been entered, and provide any details they might need, like when the winner will be announced. Get Started with Facebook Messenger Chatbot Templates Today! Each of these templates is designed to be the basic framework for a bot and can be up and running in a matter of minutes. Choose the one that’s best-suited to your business and goals, and use the chatbot builder to customize the content to your own business. Simply edit the default text, pages, and menus to reflect your brand, and add any additional content you need. Facebook Messenger marketing is one of the best ways to reach cultivate new customer relationships today. And with a few of the ready-made Facebook Messenger chatbot templates available in MobileMonkey, getting started is easier than ever. Just point, click, and personalize with your business info. 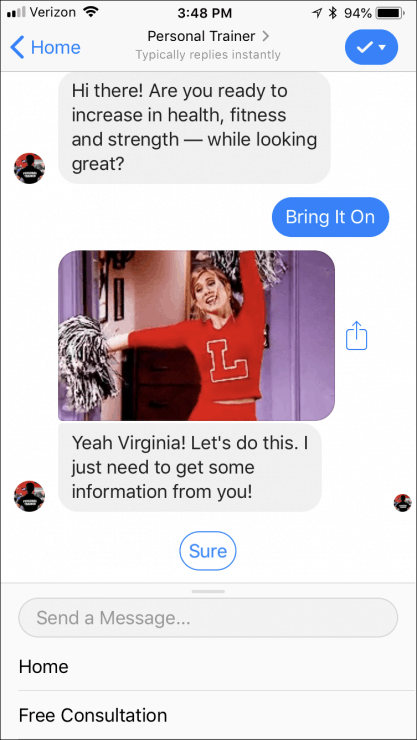 And like that, you’re set to launch a list-building, FAQ-answering, conversion-driving Facebook Messenger marketing chatbot. Learn everything you ever needed to know about effective Facebook Messenger marketing with a brand new chatbot marketing online video training. We def want to know about more templates that’d be helpful! Do you happen to know a template for a swiming school (academy, camp, et)? Thank you so muc for you help! Hi Renato, thanks! We’re always open to making new templates our customers need, and a template for a camp is a great one. Thanks for asking!